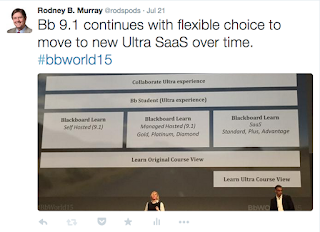 Rod discusses his experience at Bb World 2015, especially what he learned about the new SaaS offerings and Ultra Experience. Listen to the audio podcast as usual or listen and watch accompanying slides via Youtube. Thanks go to Jim Chalex, Sr. Director of Product Management, and Greg Ritter, Product Management Director at Blackboard Inc, for their BbWorld presentations on this topic. I hope I got it right!